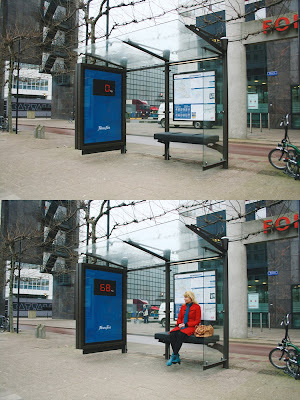 directdaily: Fitness First "Bus Stop"
People waiting on the bench of this bus stop could see their measured weight in the poster space. Fitness First. Agency: N=5 Amsterdam, The Netherlands. Faller "The world as model"
Tampax "A gift from Mother Nature"
Masa Pest Control "Miniature magazines"
Eye Bank Coordination & Research Centre "Donate"
The Weingart Homeless Homeless Project. Milano Chapter Motoclub "Ladies of Harley"
Restaurant-bar Le Cactus "Monday Hot Wings"
Adidas Originals "The Ting Tings"
Georgia Max Coffee "Ski Toilets"
Rotary Blood bank, Rotary International "Heart"
WWF Earth Hour "Darth Fladder"
Ophthalmic Institute of Curitiba "Glasses"
Galle Literary Festival "Books are back"
NRDC "Global Warming - Hot Cup & Sleeve"
Saatchi & Saatchi "Lamp for dark times"
Frontline Flea & Tick Spray "Crawling"
Tryvann Winter Park "The snowing billboard"
Courage India "Light up your lungs"
AXA Bank "House of Cards"
3M Earplugs Calendar "Plug in"
Risol Solar Home Systems "Swedish wine"